To increase international exposure and enrich learning experience, we are constantly working with local and international organizations to provide internship opportunities for current students in the areas of food safety, health promotion, and health economics. Please visit our website for updated information regarding internship opportunities. Jonathan was selected an intern of the Department of Food Safety and Zoonoses at WHO, helping with the Food Safety Programme from Sep - Dec 2015. Processed meat and red meat were classified earlier as Group 1 and Group 2A carcinogen by the World Health Organization (WHO), sparking worldwide controversy. 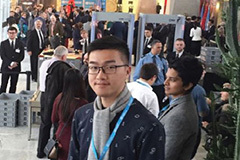 While people in Hong Kong registered the news and began asking whether they should give up comfort foods like sausages and bacon, HKBU student Jonathan Ng was at the heart of the action at WHO headquarters in Geneva as one of the insiders. Jonathan, who is studying for a master’s degree in Environmental and Public Health Management, competed against thousands of global applicants and was selected as a handful of interns in the WHO department of Food Safety and Zoonoses, helping to develop databases and learning tools to raise public awareness on food safety and the risk of foodborne diseases. Andy was selected an intern of the Department of Public Health, Environmental and Social Determinants of Health at WHO, helping with the Radiation Programme from Jan - April 2017. 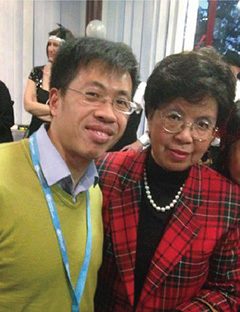 Subsequently he came to Hong Kong to undertake an MSc programme in Environmental and Public Health Management at HKBU. Because he’s always up for a challenge, he chose to study Research and Environmental Monitoring Methodology and Integrated Waste Management, a discipline recognised to be difficult and usually avoided by students. He even took the initiative to engage his teachers in discussions after class. All this because he firmly believed that the subject was closely related to daily life. His proactive attitude gained him an internship at the World Health Organization (WHO). He shares: “At the Department of Public Health, Environmental and Social Determinants of Health, I was given the opportunity to take part in compiling a manual entitled ‘Food Safety after a Radiation Emergency: Handbook for Health Risk Communication’. Since I didn’t know much about the topic, I equipped myself by reading up on the subject before embarking on my new job. Upon starting at WHO, I kept my eyes open and didn’t hesitate to ask questions when communicating with my supervisor and colleagues. 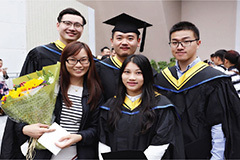 Gradually I gained a better understanding of the subject.” Without fear of the language barrier, Andy proactively participated in various seminars and discussions, broadening his horizons as well as acquiring the skills of communicating and getting along with others in culturally diverse environments. With this conviction, Andy is planning to do a PhD with a view to uncovering new knowledge as well as serving as a bridge between academia and the public. 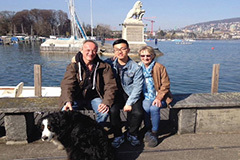 Andy gets along well with his landlord (first from left) and his mum in Zurich. 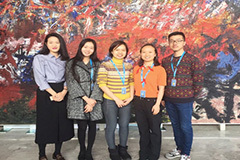 Mr Chang participated in MSc EPHM’s Internship Programme to work at the World Health Organization (WHO) in Geneva in 2017. He is currently working in an environmental related company - Hansk New Materials Holdings Limited (漢斯克新材料集團有限公司). Kennie shared his fruitful opportunity to work at the WHO and introduced his current job nature and shared his insight on working in the environmental and public health fields. My major task during the internship in WHO is working with the external experts for the “Joint Meeting on Pesticide Residues”. A series of teleconferences has been coordinated, by which controversial scientific data, equivocal experimental results were discussed and action items were determined. All details are documented and saved by me in the WHO database. I also regularly update the monograph drafts in the database before the official meeting among the experts, WHO and the Food and Agriculture Organization of the United Nations in September. The target is to determine the Acceptable Daily Intake of the pesticide residues on food. Moreover, I am the administrator of the WHO food safety database to support the requests of data from different institutes in the world, including the Centre for Food Safety in Hong Kong. For example, data of the average consumption quantity of fish and mercury concentration are available for evaluating the impact on consumers. Since we are calling for scientific data from different technical institutes in the world to prepare the Codex meeting in 2018, I am also involve in editing the Codex Alimentarius documents concerning lead, methylmercury and cadmium in certain food commodities in this regard. Occasionally, I will translate some food safety news from China for helping my colleagues to understand the China situations better. Last but not the least, working together with talented people from different professional backgrounds in WHO has certainly enriched my knowledge, to which I value as a great and unforgettable experience. Fiona was selected an intern of the Hong Kong Organic Center Jun - Sep 2017. I am glad to have the chance to work as an intern in the Hong Kong Organic Resource Centre for a month. During the internship period, I not only supported administrative work in the office, but also assisted in holding ceremonies and exhibition. One of my unforgettable memories is being a helper in Health Expo 2017. 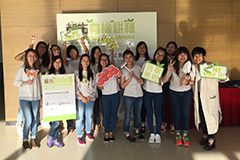 In this exhibition, my task was to promote the “Organic Buy” app to the visitors. At first, not many visitors knew what “Organic Buy” app was. However, after my explanation of the usage of the app, they found the app useful to them in selecting and buying the organic food that they wanted. I am very happy about the successful promotions of the “Organic Buy” app because it really helps the consumers to avoid purchasing uncertified organic products.